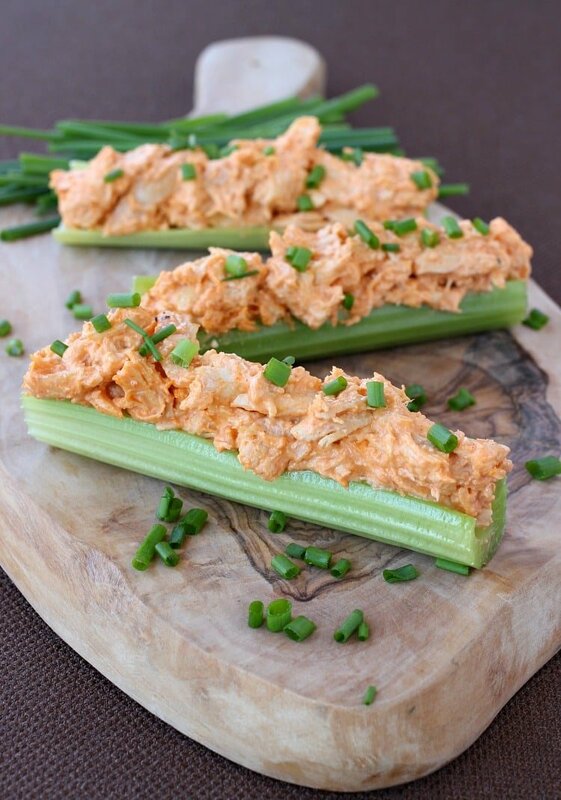 Buffalo Chicken Celery Sticks are a totally easy low carb chicken recipe! You can serve them for appetizers, lunch or dinner! Low carb chicken recipes are a huge search topic. It seems that everyone these days is trying to find low carb recipes, and we are no exception! Some of our favorites are these Chicken Stuffed Portobello Mushrooms, this Sausage and Vegetable Soup or these Easy Chicken and Broccoli Meatballs. If you’re looking for beef recipes, you can try these awesome Fiesta Steak Bites or this Slow Cooker Shaking Beef recipe. 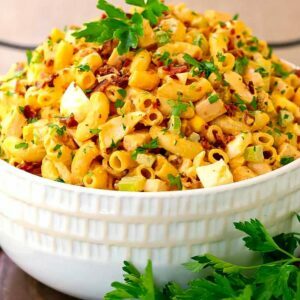 All of these low carb recipes can be easily adjust to your non low carb family members by adding sides of rice or potatoes or pasta. 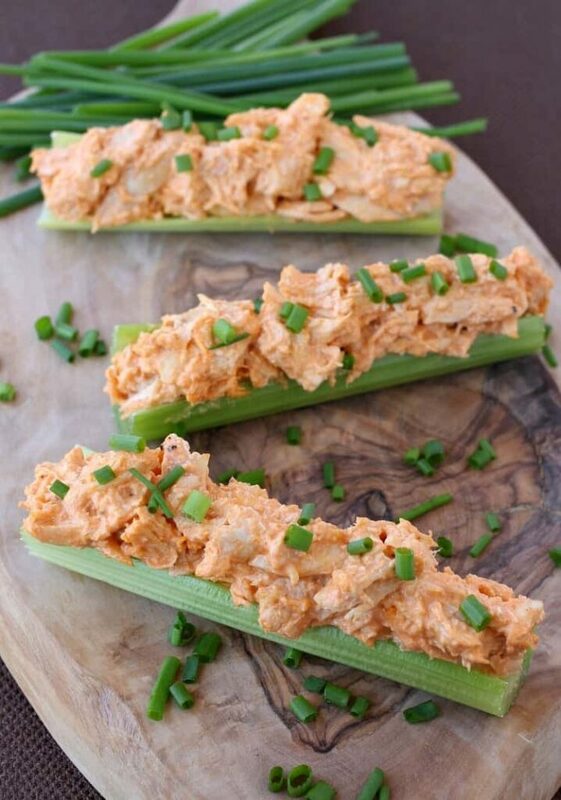 Even if you’re not following a low carb diet in any way, these Buffalo Chicken Celery Sticks are such an easy chicken recipe you’re going to be making them all the time. Because we’re all looking for easy chicken recipes – like ALL the time, right? The best part about these Buffalo Chicken Celery Sticks is that they can be served for many different meal ideas. They’re perfect for appetizers, game day food, lunch ideas, snack time and yes. Dinner. Dinner? A celery stick? Ok so you might not be having JUST these chicken celery sticks for dinner but they are a great start! Add a bowl of creamy soup, some cauliflower fried rice or these Italian Deli Roll Ups and you’re set. Can You Make This Chicken Recipe Of Time? Oh yes, and you should. The flavors blend together in the refrigerator the more it sits in there. And this buffalo chicken is so easy, it literally takes about 5minutes to make so why not. Then you can fill your celery sticks when you’re ready to eat! If you are making these for a party you can definitely fill them ahead of time too! You can use canned chicken, leftover baked or grilled chicken, rotisserie chicken from the store or any chicken you like! We’ve made this chicken recipe with just about all types of chicken and it’s always delicious! 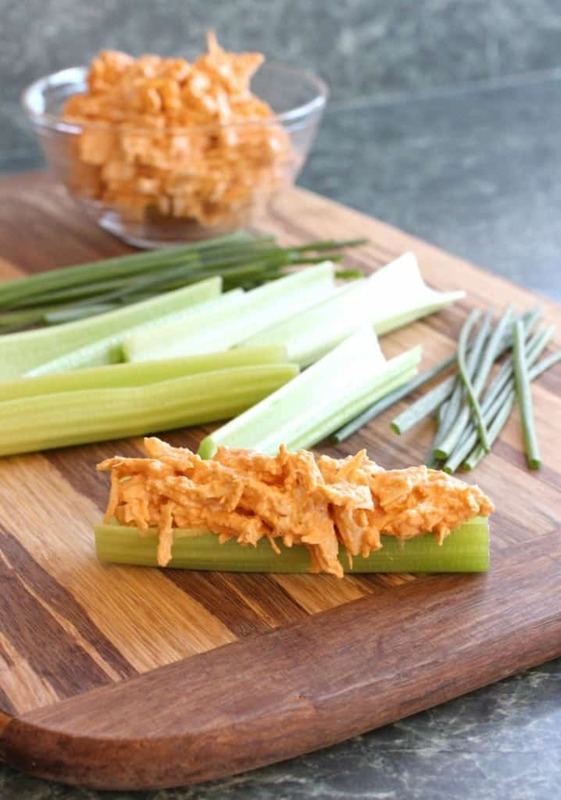 Watch How Easy These Buffalo Chicken Celery Sticks Are To Make! 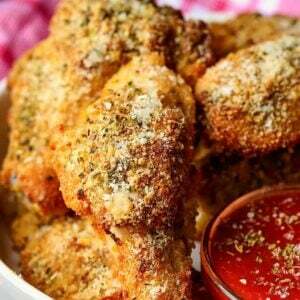 This easy chicken recipe is a perfect low carb snack or lunch idea! We make these for appetizers or even a light dinner, just add a cup of soup on the side! These look fantastic! I love everything buffalo sauce! Thanks Molly – me too! I made mine even more simple…… leftover rotisserie chicken, some chopped green onion and Buffalo Ranch Dressing! just wonderful! Will be one of quick go to dinners or lunches for sure! Yes, this would actually be a great use for canned chicken! Can u make these the night before? Or are they only good to eat right after you make them? You can definitely make the chicken filling the night before and then stuff them right before you need them. They would probably get watery if you stuffed them ahead of time. I love this simple but great recipe! It is also really good with Endive instead of celery too! That sounds perfect, Thanks Michelle! I just put chicken in he crockpot on low overnight with buffalo sauce. I plan on mixing it with sour ccream and cream cheese in the morning and having it for lunch with celery or cucumbers ????????yummy! I can imagine this on top crisp Romaine with a bit of blue cheese dressing. Yum either way. You’re right, that would be good too Julie! Tiffany, yes this is really meant to be served cold. Is there a reason why you’re looking to heat it up? I was just looking for a way to use yo leftover turkey and stumbled across these on Pinterest – brilliant!! Love this idea! ???? Thanks Heather- great idea for this recipe! what is the carb count on this then? Is the serving 3 celery sticks, cut in half per one person? This is genius! I love how you took the guilt out of one of my favorite foods! This is creative and flavorful! What a great easy recipe! Do you know the nutrition value on it? How many carbs? Not sure about the exact nutritional value but as far as carbs…ZERO. Zero carbs:) Enjoy! What’s the nutrition on this? Trying to input into MFP but I didn’t eat all in one sitting so… ???? it’s giving me 600 cal. for the mayo. Thank you. I’m working on getting nutritional info on my site but I don’t have it right now. When I went into MFP it gave me the correct info I believe…1.2 carbs per celery stick, 4.4 grams of fat, 8.8 grams protein and 80 calories. Perfect! Thank you so much, Dan. I will input that for now (assuming that is per stick and amount on the stick) and will keep my eyes peeled for an update. Great recipe! I’ve made it twice in the past two weeks since finding it on Pinterest. This is a keeper! We love it too! Thanks for letting me know Lisa! What kind of buffalo chicken sauce do you use? Does it have sugar in it? You can use any type of buffalo wing sauce you like, I used Sweet Baby Rays and it doesn’t have any sugar. Not sure if I just overlooked it, but how many servings is this recipe for? It makes 12 celery sticks. 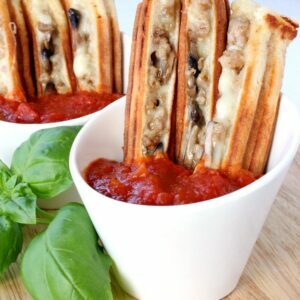 This looks great but how many servings are12 sticks supposed to make? I am just starting carb cycling. The recipe makes 12 celery sticks, however many servings is up to you! I don’t have the nutritional information if that’s what you’re looking for, but these are very low carb. It definitely is for us! Thanks Jeri! Can you sub the mayo for cream cheese? When I usually make buffalo chicken dip, I use cream cheese and am not the biggest fan of mayo! I’m sure you can as long as it’s at room temperature! 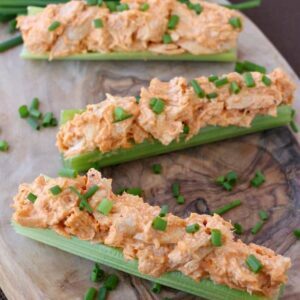 There are several delicious and easy-to-make chicken recipes available online and I think Buffalo Chicken Celery Sticks should be among the must-try list. What I like about this recipe is that there’s no need for you to cook it and the ingredients are very simple. Thank you for sharing this! oh no one wouldn’t be enough for me!